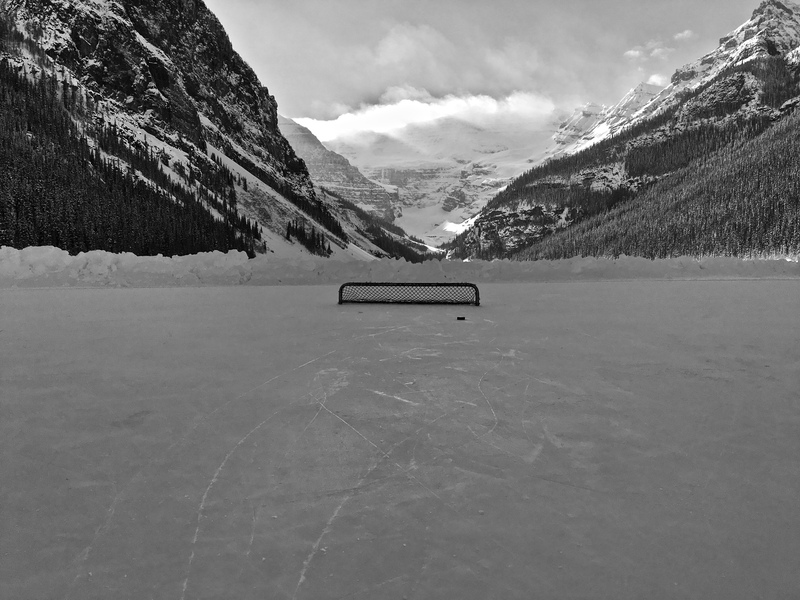 Physics meets winter sports at the Lake Louise Winter Institute, a particle physics conference held annually in the beautiful Canadian Rockies. 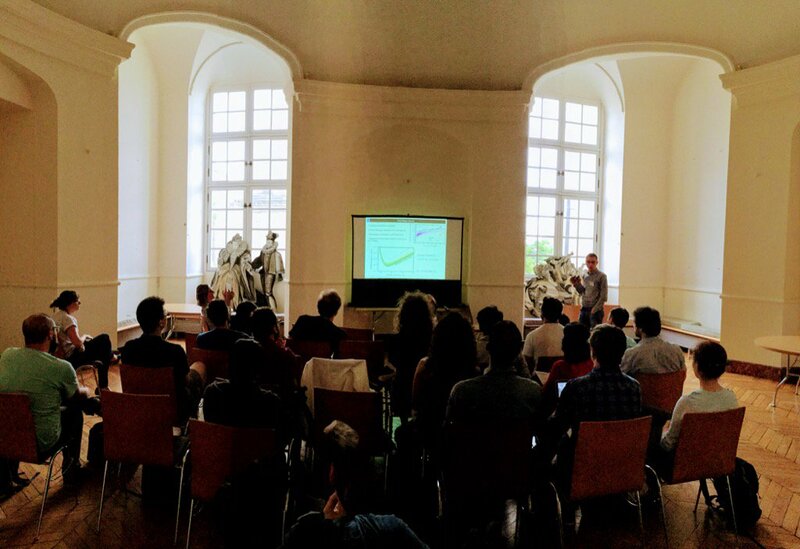 On February 12, 2019, Evan Shockley from University of Chicago presented at the conference on behalf of the XENON collaboration. The talk focused on the latest, world-leading WIMP results, and included a status update on XENON1T and its imminent upgrade, XENONnT. The talk is available here. 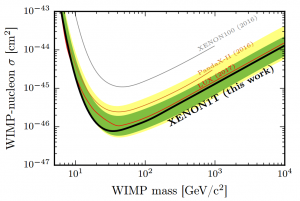 XENONnT will feature a larger detector and even lower background than XENON1T, making it ~10 times more sensitive to interactions from dark matter and other rare processes. With installation coming later this year, it’s an exciting time for the XENON collaboration and the field of dark matter research! 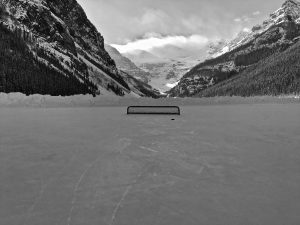 This entry was posted in Talks and tagged 2019, science, talk, winter on February 15, 2019 by Evan Shockley. XENON1T was built to observe the recoil of xenon-atoms, which may be caused by the interaction of a Weakly Interacting Massive Particle (WIMP) as it passes through the detector. A recoiling xenon atom produces scintillation light and ionization that XENON1T detects as an S1 and S2 signal, which carry information of the recoil type, energy and position in the detector. 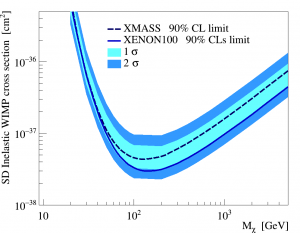 The first results of the XENON1T were published on the spin-independent WIMP-nucleon interaction, which is expected to dominate the WIMP scattering rate. However, models of WIMPs exist where this contribution would be suppressed or vanish. 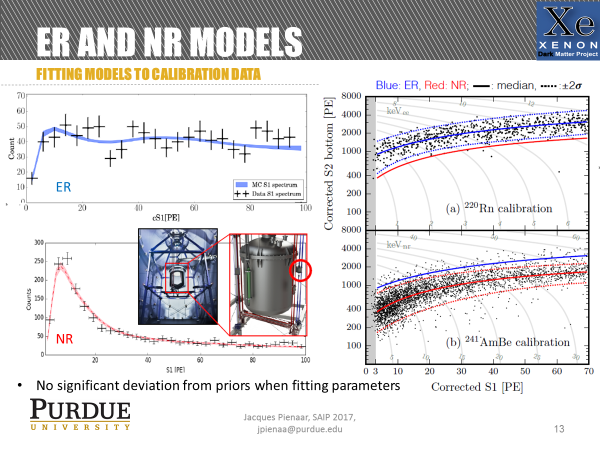 XENON has therefore performed searches for alternative WIMP-recoil spectra, such as the one expected if the scattering depends on the nucleon spins. A careful accounting of all the possible WIMP-nucleon interactions showed that WIMPs can also interact with pions— subatomic particles that contribute to the strong force that binds atoms together. The figure illustrates a WIMP (χ) scattering via a mediator line on a pion (π) exchanged between a proton and a neutron in the xenon nucleus. The xenon atom recoils from the interaction, which can be observed with our detector. 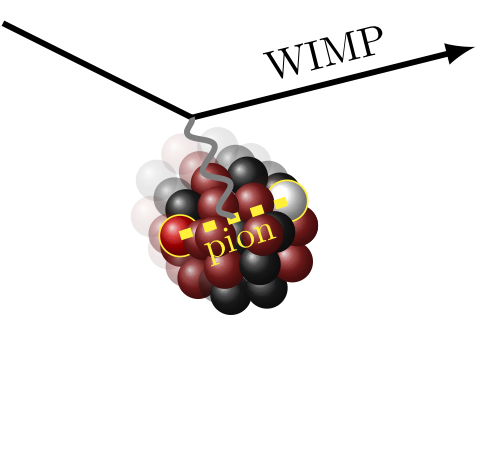 Similarly to the spin-independent recoil, the wimp-pion interaction happens in a way where the WIMP scatters coherently, off the entire xenon atom together. 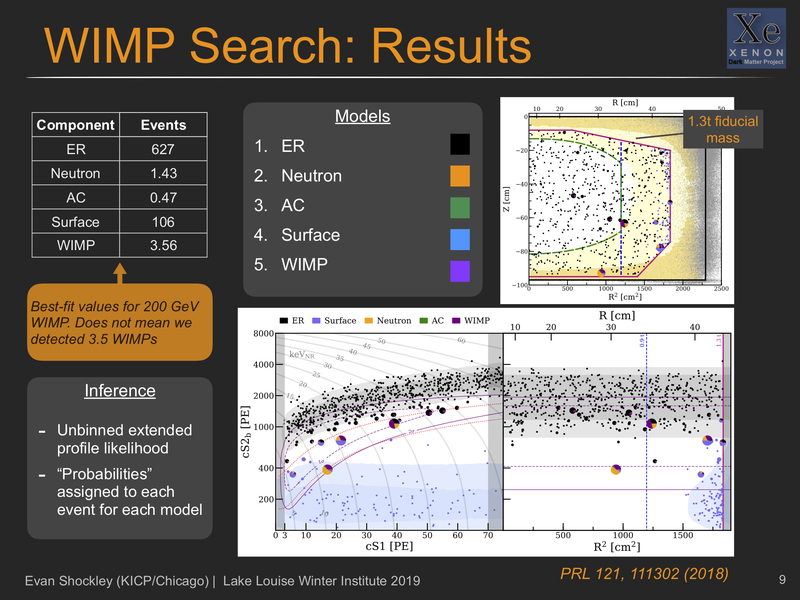 The analysis was performed with the same tools as the main XENON1T spin-independent WIMP search, and 1 tonne-years of data. No significant evidence for a signal was observed, so we set the first limits on the spin-independent WIMP-pion interaction strength. An open access pre-print of the paper can be found on the arxiv. 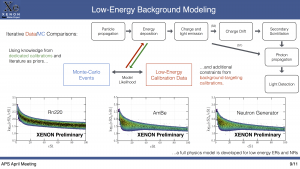 This entry was posted in Publications, Science and tagged 2019, analysis, pions, publications, science, XENON1T on January 23, 2019 by Knut Morå. 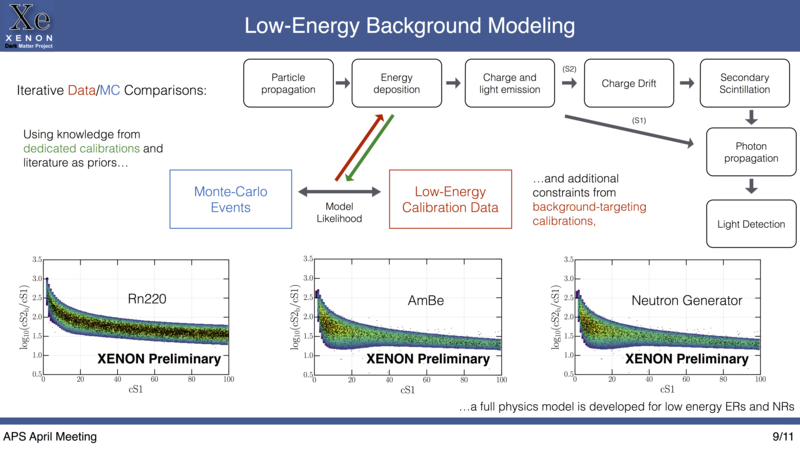 This shows how we use data from calibrations to understand every piece of physics in our detector, from a particle entering and hitting a xenon atom to the measurement of the light and charge produced by this interaction. 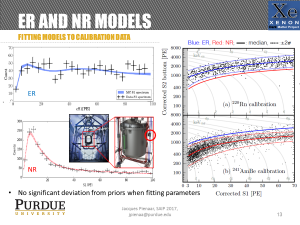 Combining the many different calibrations we do, we develop a complete model of XENON1T which is then used in a statistics framework to determine whether the background data we’ve taken contains WIMPs. Stay tuned as it won’t be too long before we can release those results as well! This entry was posted in Talks and tagged 2018, calibration, science, talk, XENON1T on April 19, 2018 by Joseph Howlett. While the microscopic nature of dark matter in the Universe is largely unknown, the simplest assumption which can explain all existing observations is that it is made of a new, as yet undiscovered particle. Leading examples are weakly interacting massive particles (WIMPs), axions or axion-like particles (ALPs), and sterile neutrinos. 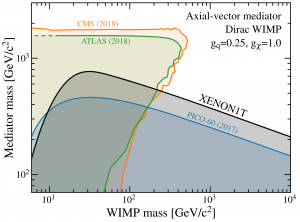 WIMPs with masses in the GeV range, as well as axions/ALPs are examples for cold dark matter while sterile neutrinos with masses at the keV-scale are an example for warm dark matter. Cold dark matter particles were nonrelativistic at the time of their decoupling from the rest of the particles in the early universe. 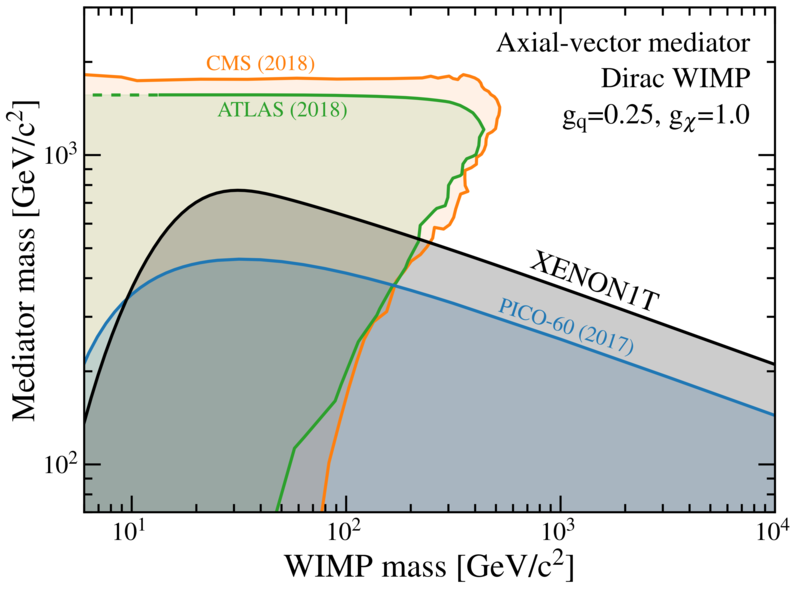 In contrast, warm dark matter particles remain relativistic for longer, retain a larger velocity dispersion, and thus more easily free-stream out from small-scale perturbations. 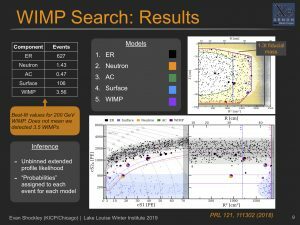 Astrophysical and cosmological observations constrain the mass of warm dark matter to be larger than about 3keV/c2, with a more recent lower limit from Lyman-alpha forest data being 5.3keV/c2. 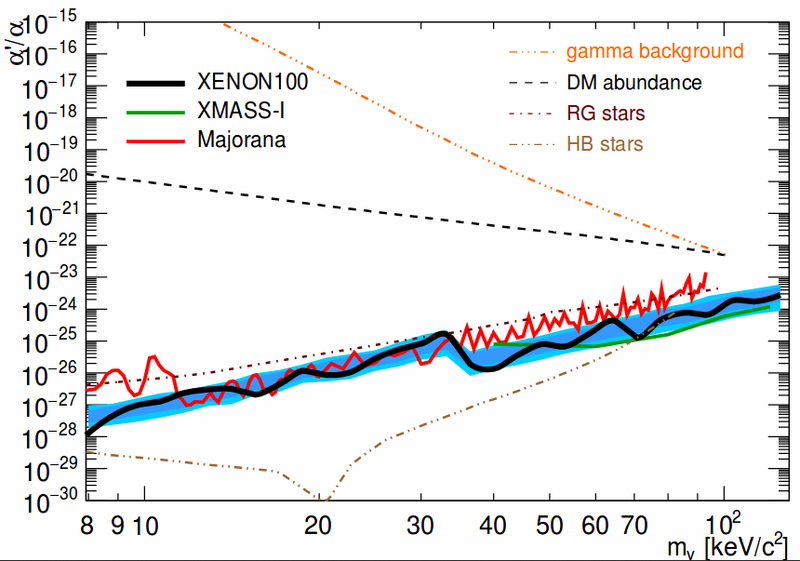 Another example for warm dark matter particles are bosonic super-WIMPs. These particles, with masses at the keV-scale, could couple electromagnetically to standard model particles via the axioelectric effect, which is an analogous process to the photoelectric effect, and thus be detected in direct detection experiments. 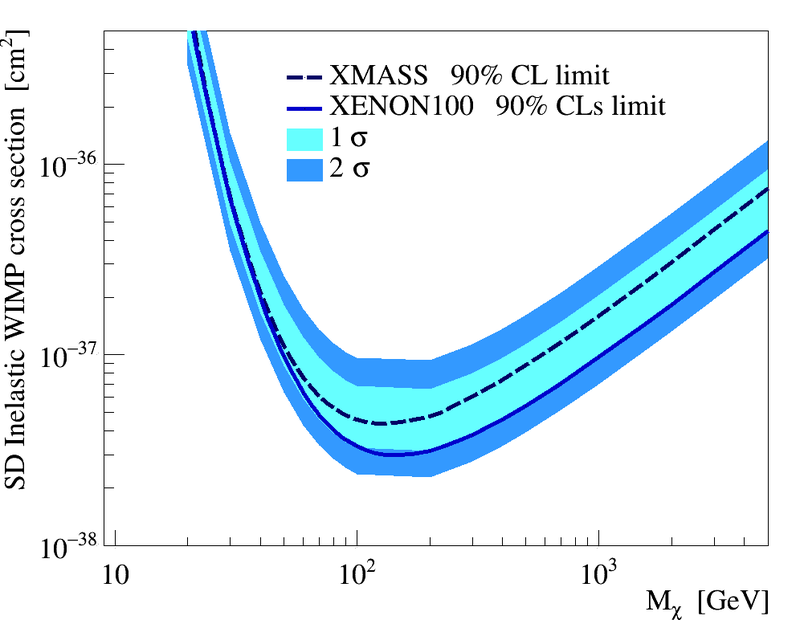 The limit derived from the XENON100 experiment on the coupling of SuperWIMPs. We searched for vector and pseudo-scalar bosonic super-WIMPs with the XENON100 experiment. 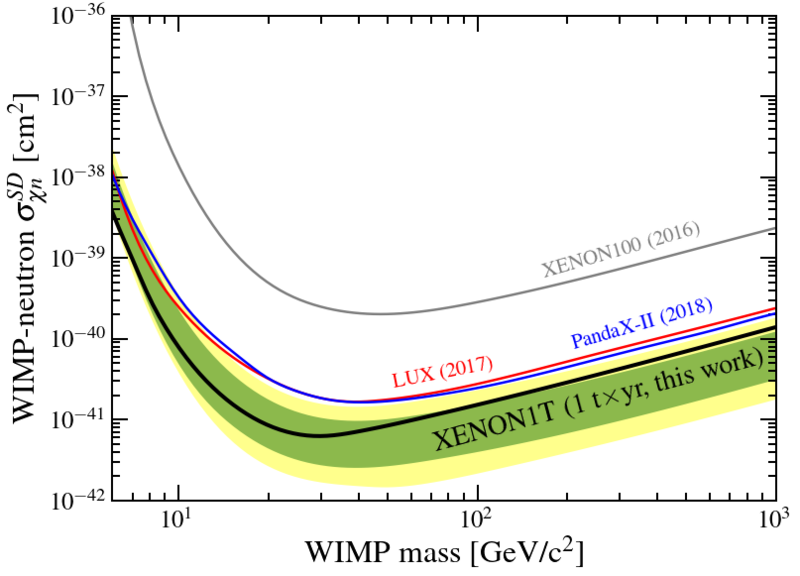 The super-WIMPs can be absorbed in liquid xenon and the expected signature is a monoenergetic peak at the super-WIMP’s rest mass. A profile likelihood analysis of data with an exposure of 224.6 live days × 34kg showed no evidence for a signal above the expected background. We thus obtained new upper limits in the (8 − 125) keV/c2 mass range, excluding couplings to electrons with coupling constants of gae > 3 × 10−13 for pseudo-scalar super-WIMPs and α′/α > 2 × 10−28 for vector super-WIMPs, respectively. We expect to improve upon these results with the XENON1T detector, which operates a larger mass of liquid xenon with reduced backgrounds. Our results were published in Physical Review D 96, 122002 (2017) and are of course also available at the arxiv. This entry was posted in Publications and tagged 2018, analysis, construction, dark matter, publications, science, SuperWIMPs, XENON1T on January 22, 2018 by Laura Baudis. Most direct detection searches focus on elastic scattering of galactic dark matter particles off nuclei, where the keV-scale nuclear recoil energy is to be detected. 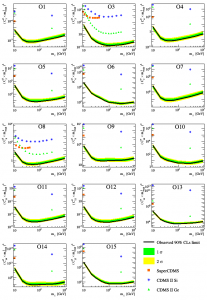 In this work, the alternative process of inelastic scattering is explored, where a WIMP-nucleus scattering induces a transition to a low-lying excited nuclear state. The experimental signature is a nuclear recoil detected together with the prompt de-excitation photon. 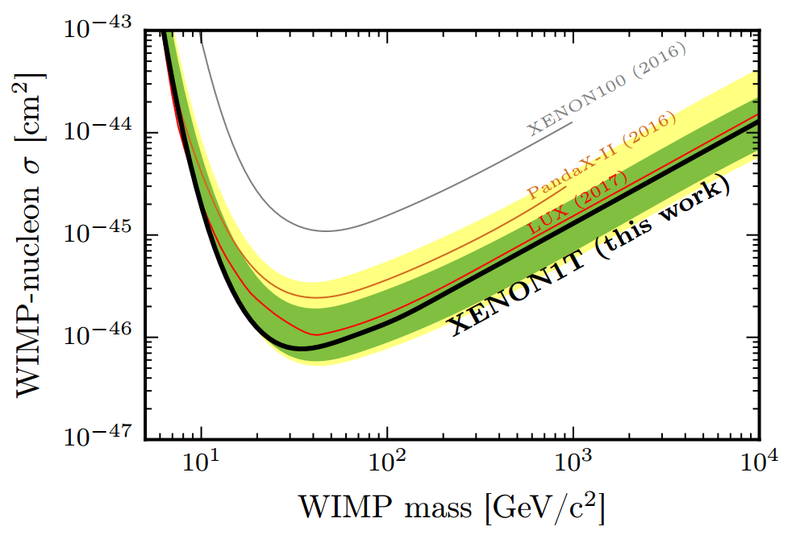 We consider the scattering of dark matter particle off 129Xe isotope, which has an abundance of 26.4\% in natural xenon, and when excited to it lowest-lying 3/2+ state above the ground state it emits a 36.9 keV photon. This electromagnetic nuclear decay has a half-life of 0.97 ns. The WIMP inelastic scattering is complementary to spin-dependent, elastic scattering, and dominates the integrated rates above 10 keV of deposited energy. In addition, in case of a positive signal, the observation of inelastic scattering would provide a clear indication of the spin-dependent nature of the fundamental interaction. The search is performed using XENON100 Run-II science data, which corresponds to an exposure of 34×224.6 kg×days. No evidence of dark matter is found and a limit on dark matter inelastic interaction cross section is set. 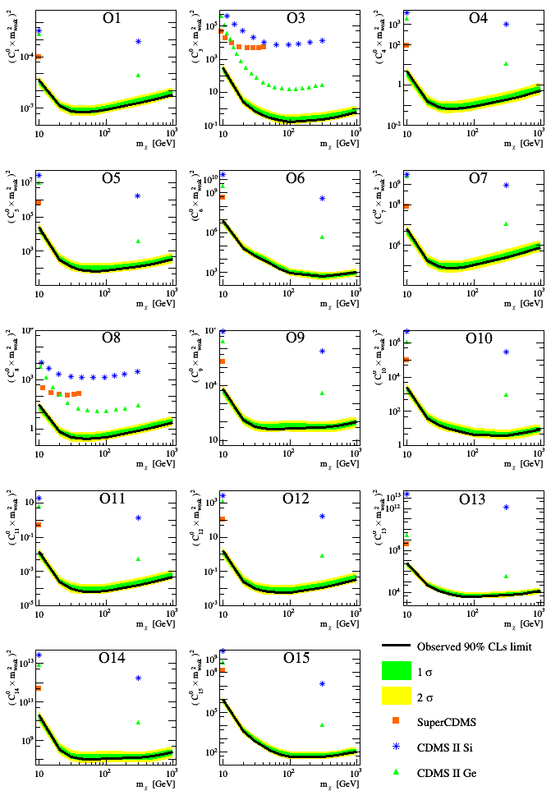 Our result, shown in the Figure, is the most stringent limit for the spin-dependent inelastic scattering to date, and set the stage for a sensitive search of inelastic WIMP-nucleus scattering in running or upcoming liquid xenon experiments such as XENON1T, XENONnT, LZ, and DARWIN. Full details may be found in this article: Phys. Rev. D 96, 022008 and on the arxiv. This entry was posted in Publications and tagged 2017, analysis, dark matter, electronic recoil, inelastic, publications, science, xenon-129, XENON100 on July 27, 2017 by Alessandro Manfredini. At the 62nd annual conference of the South African Institute of Physics (SAIP), hosted by the University of Stellenbosch, Jacques Pienaar presented the results of our first science run with XENON1T. 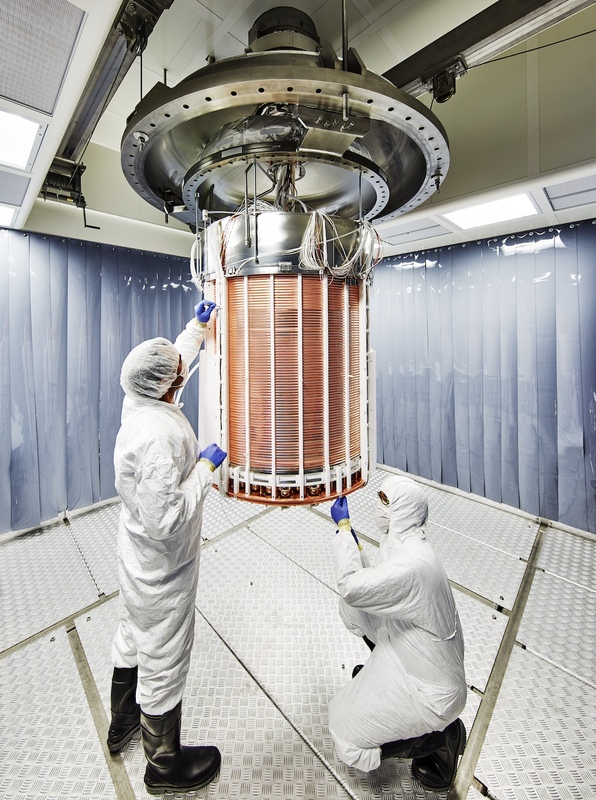 While a dark matter particle candidate still eludes us, we are able to demonstrate that for the first time a tonne-scale liquid Xenon dark matter detector is not only operating, but doing so very successfully. The work done up to this point has given us a thorough understanding of the electronic and nuclear recoil response in our detector, which we can use to look for dark matter candidates. This of course is just the start. In this first result we had an exposure of only 0.1 ton.years, but our design goal is 2 ton.years. Therefore much work still lies ahead to probe for dark matter, and indeed we have more than 3 times as much data available already to push the bounds of our knowledge further. Stay tuned! 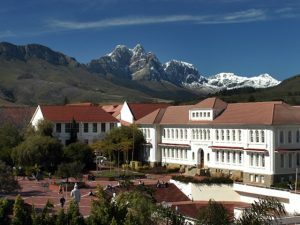 This entry was posted in Talks and tagged 2017, science, talk, XENON1T on July 12, 2017 by Jacques Pienaar. “The best result on dark matter so far! … and we just got started!”. This is how scientists behind XENON1T, now the most sensitive dark matter experiment world-wide, hosted in the INFN Laboratori Nazionali del Gran Sasso, Italy, commented on their first result from a short 30-day run presented today to the scientific community. Dark matter is one of the basic constituents of the Universe, five times more abundant than ordinary matter. Several astronomical measurements have corroborated the existence of dark matter, leading to a world-wide effort to observe directly dark matter particle interactions with ordinary matter in extremely sensitive detectors, which would confirm its existence and shed light on its properties. However, these interactions are so feeble that they have escaped direct detection up to this point, forcing scientists to build detectors that are more and more sensitive. The XENON Collaboration, that with the XENON100 detector led the field for years in the past, is now back on the frontline with the XENON1T experiment. The result from a first short 30-day run shows that this detector has a new record low radioactivity level, many orders of magnitude below surrounding materials on Earth. With a total mass of about 3200kg, XENON1T is at the same time the largest detector of this type ever built. The combination of significantly increased size with much lower background implies an excellent dark matter discovery potential in the years to come. The XENON Collaboration consists of 135 researchers from the US, Germany, Italy, Switzerland, Portugal, France, the Netherlands, Israel, Sweden and the United Arab Emirates. The latest detector of the XENON family has been in science operation at the LNGS underground laboratory since autumn 2016. The only things you see when visiting the underground experimental site now are a gigantic cylindrical metal tank, filled with ultra-pure water to shield the detector at his center, and a three-story-tall, transparent building crowded with equipment to keep the detector running, with physicists from all over the world. 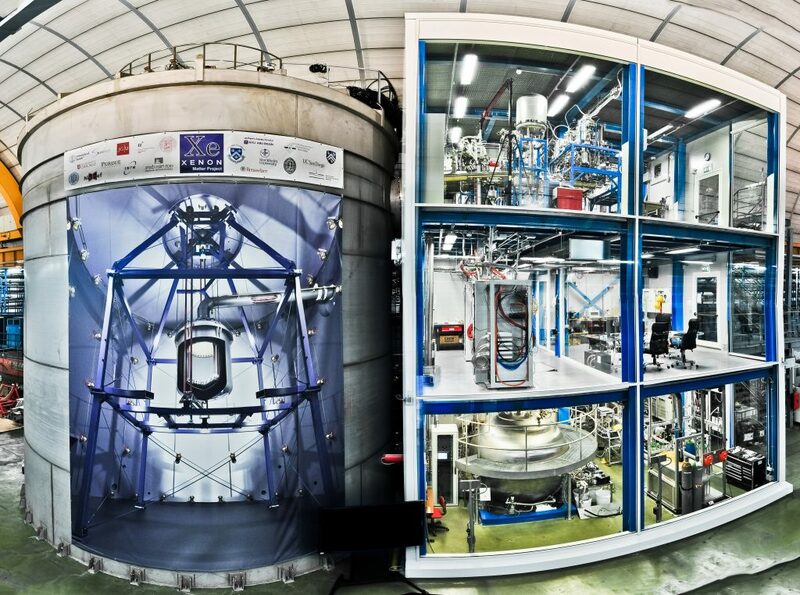 The XENON1T central detector, a so-called Liquid Xenon Time Projection Chamber (LXeTPC), is not visible. It sits within a cryostat in the middle of the water tank, fully submersed, in order to shield it as much as possible from natural radioactivity in the cavern. The cryostat allows keeping the xenon at a temperature of -95°C without freezing the surrounding water. The mountain above the laboratory further shields the detector, preventing it to be perturbed by cosmic rays. But shielding from the outer world is not enough since all materials on Earth contain tiny traces of natural radioactivity. Thus extreme care was taken to find, select and process the materials making up the detector to achieve the lowest possible radioactive content. 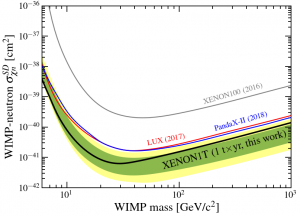 Laura Baudis, professor at the University of Zürich and professor Manfred Lindner from the Max-Planck-Institute for Nuclear Physics in Heidelberg emphasize that this allowed XENON1T to achieve record “silence”, which is necessary to listen with a larger detector much better for the very weak voice of dark matter. As always, feel free to contact the XENON collaboration at contact@xenon1t.org. 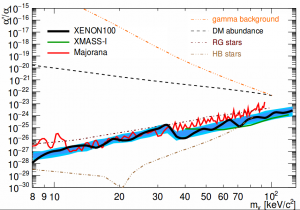 This entry was posted in Experiment, Science and tagged 2017, analysis, background, dark matter, results, science, science run 0, XENON1T on May 18, 2017 by Sander Breur.